Firstly, the concern over how little coverage this long-running dispute between the nuclear nations receives in the European Media. Secondly, the apparent apathy of the international community regarding the risk of nuclear conflict in the region & to the urgent need for meditation if the disputing parties are to be brought to the negotiating table. Finally, the concern that the exclusion of Kashmiris from any future peace process will jeopardize the sustainability of any settlement. The Kashmir Council-EU is an independent non-governmental body. We are non-sectarian, reject violence, and seek to collaborate with other organisations which have broadly similar aims. We receive no funding from any political party & rely on the dedication & energy of our staff of volunteers to get things done. Foster a climate of mutual confidence & respect within which negotiations to resolve the Kashmir conflict can proceed with a realistic possibility of success. 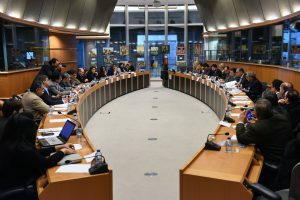 Develop a common agenda for political action by European NGOs to resolve the Kashmir dispute. Persuade the International Community that it has a real role to play in securing an effective peace process for Kashmir. Secure the repeal of the so-called ‘draconian laws’ which give impunity to human rights abusers. Achieve the demilitarization of Kashmir. Create opportunities for Kashmiri youth to benefit from European education & training. Support independent research & policy development on Kashmir. Awareness building and advocacy: Through seminars, exchanges of ideas, conferences, exhibitions, meetings, press briefings, protests, demonstrations, walks, rallies & campaigns. Research & documentation: Through leaflets, brochures, banners, press releases, news magazines, articles, letters to editors, reports, surveys & – manuals. Networking: Through visits, contact-building initiatives, training courses & festivals etc.